For my son's 4th birthday we were looking for something special to do. For his first birthday we took him to the Sacramento Zoo and his love of giraffes began there. We wanted to experience a large zoo with more animals and attractions to see. The San Francisco Zoo was the perfect answer for us. We had a wonderful time at the Zoo and we were able to have a preview of the new Elinor Friend Playground. The new playground has 3 different themed playgrounds that are each unique and offer different play experiences. My son had the honor of being the first kid to play on the playground since it was a few days before the opening. He was in awe on how cool it was. He kept saying "this is awesome" "wow cool" over and over. It was so sweet to see him having so much fun. When it was time to leave the play area my son was very upset since he was having so much fun. He crossed his little arms and gave a sad face asking for 5 more minutes. I am sure he would have stayed all day if we would have let him. We had many more excited zoo activities to do like visit the petting zoo, ride the merry go round and take a mini train ride. A playground such as this one at a Zoo is perfect! I can see so many families enjoying time at the zoo and then having place for the kids to run around and get their energy out. My son was doing a great job listening as we looked at the animals but I could tell he needed to run around a little so they play ground was great. He went on the swings, the slides and crawled through the tunnels. He had a wonderful time! This addition to the zoo makes it even more family friendly. We are planning many more trips to the San Francisco Zoo to learn and to play. After several years of fundraising, planning, and design, and over one year of construction, the Elinor Friend Playground at the San Francisco Zoo is ready for its grand re-opening. As part of The Americas Campaign capital campaign chaired by Dianne Taube, this $3.2 million project has been made possible in large part by the Friend Family and other generous donors. Additional naming rights within the Playground are still available at this time, totaling approximately $1 million (see the form below to help with this important project). This 36,000-square-foot, state-of-the art project is sure to ignite the imaginations of the 300,000 children of all ages and abilities who visit the Zoo each year. The new playground is modeled after three distinct bio-regions, which take their themes from specific ecosystems and appeal to distinct age groups: a River Play Area for toddlers (6 months-2 years), a Polar Zone exploration space for pre-schoolers (2-5 years), and a Banyan Tree climbing structure for pre-teens (5-12 years). Along with striking natural forms, the architecture integrates a wide range of materials and textures in glorious detail that mimic those found in nature and encourage curiosity among young explorers. As an example, a charming frog sculpture in the River Play Area acts as a symbol of the Zoo’s mission to connect people with wildlife, inspire caring for nature, and advance conservation action. In support of this mission, a portion of the funds raised for the playground will go toward the Zoo’s Sierra Nevada Yellow Legged Frog Conservation Program. Click here for more information about this program. Crawling through a beaver dam, sliding down an iceberg, or swinging through a tree, all children share opportunities for unique wildlife adventures, take age-appropriate risks, and immerse themselves in naturalistic environments. 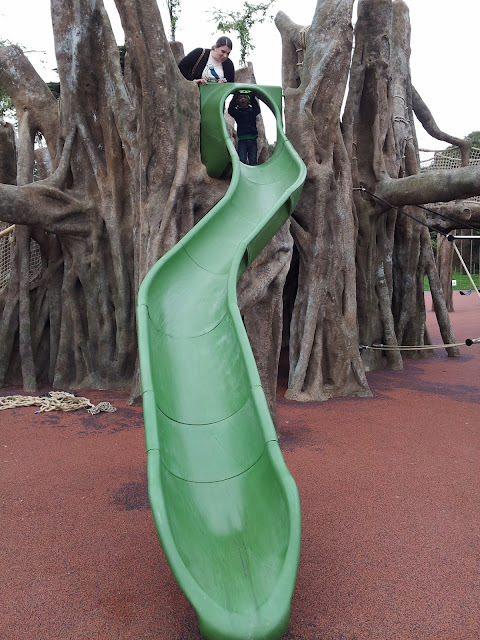 Each of the play structures is built with fully compliant ADA accessibility features to accommodate children with physical and mental disabilities, with a strong emphasis on exploration and adventure encouraged for all. * We were guest of the San Francisco Zoo for our visit. Thank you to the Zoo.